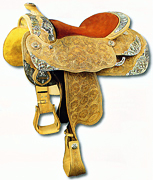 Reinsman Saddles - "Quality has a style all its own." If you are searching for a saddle built better than most, Reinsman is a great choice. Reinsman built a prominent reputation with their bits and pads. Not long after, they added this semi-customized saddle line. Reinsman does not try to be all things to all people. They specialize in professional grades of saddlery. Cultured Cowboy appreciates the Reinsman products enough to make them affordably available to you. 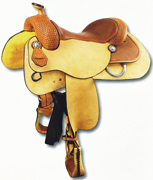 These Western saddles are best suited for the rider who is, or has the mindset, of a professional horseman. If you dream of becoming all you can be as a rider, you're in the right place. Reinsman Saddles are built tighter than most. They use a quality tooling leather that will hold a deep pattern. The company understands what professional style saddles are supposed to be, and they make them to give you every edge in winning. "Dale Martin is the Vice-President of Marketing and Product Development for Reinsman Equestrian Products. Dale is a PRCA Team Roper, Calf Roper, and Steer Roper. 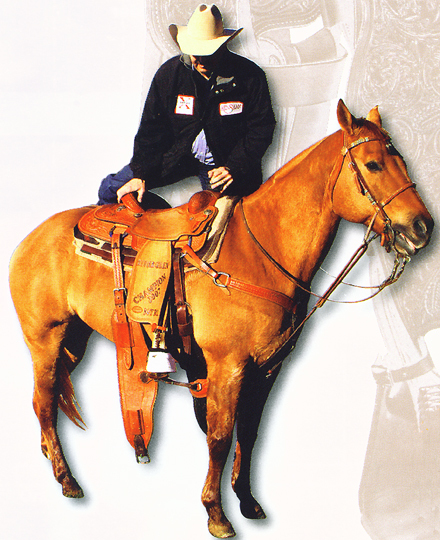 As a horseman and saddlemaker, Dale has incorporated 25 years of knowledge in all the X Series products. Dale Martin and Reinsman are committed to continue bringing you a quality product that fits a horse and works." More than a couple Reinsman executives are riding horsemen. ..."At Reinsman I feel that there is a tremendous amount of value in having our management team understand the functions and fit of the product they make. Being a horseman and an end user is an asset to the company." - Dale Martin, VP of Sales & Marketing. That said, each category of saddle, roper, racer, reiner, etc., has some great options for you. Tooling patterns, seat colors, seat styles, seat sizes, and so forth. There is a method to the Reinsman numbering system. The first digit denotes a saddle. The second digit denotes the saddle type, (Roper, Barrel, cutter, etc.). The 3rd digit denotes the tooling pattern. The 4th digit denotes the amount of tooling, (1/4, 1/2, 5/8, 7/8, full). The 5th digit denotes the seat style, ( full, bicycle). The 6th and 7th digits denote the seat size. The 8th digit denotes the color of saddle leather. The 9th digit denotes the seat color. There are some differences in the offerings for each type of saddle. Custom lettering and brands are available if you like them. the one-piece design is using a more expensive, prime cut of leather to enable it to be molded to shape without being weak or losing body over time. Far too often, the consumer is more concerned with the outward appearance of a saddle and ignores the interior of a saddle. The most important thing when looking to buy a saddle is the "guts" of a saddle. Often times with a saddle, "You get what you pay for". Your saddle is not one of the places you want to cut corners. A well made saddle with a strong tree that fits your horse is a good investment and will last many years to come. You are better off buying a used saddle that fits than buying a new saddle that does not. A lot of manufacturers claim claim to build saddles to fit the horse and rider. Sadly, our horses can't tell us what feels good, and what hurts or hinders them. Thus, we have to be intuitive enough to read between the lines and "listen" to them. Therefore, the best "listeners" in our industry are the saddle makers with experience. Look for the saddle maker who has spent just as much time in the saddle as making them. Good saddle makers will stand behind the fit and strength of their saddles. They are not looking for a one time sale. 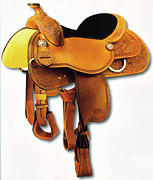 At Reinsman, we offer a 10 year warantee on our saddle tree and guarantee the fit. - Dale Martin, Vice President of Manufacturing, Sales and Marketing. 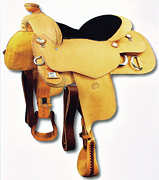 The picture (left) is an example of a well fitting saddle. As you can see, neither the front nor rear cinch are connected. When Dale gets on the horse, the saddle does not move without the cinches tied. Would you like to get a new saddle that feels like it is used? We will heavy oil any saddle for you. We prefer to use Lexol. Lexol will darken less than any other conditioner. It is PH-Balanced for the leather used in your saddle. We have been using Lexol on our personal saddles for over 30 years. Add $120.00 for about three liters of Lexol and some several hours of application. Lexol is best applied in many thin layers. To darken slightly, we will add extra virgin olive oil. To darken more, we will blend in some pure neatsfoot. The choice is yours! Your saddle will then come out of the box ready to ride in ultimate comfort! Tooling patterns protect the leather against abrasives. Tooling will "pack" the leather for durability and strength. Tooling can hide small "range" scars that are inherent to the leather before it is formed into a saddle part. Tooling adds depth and beauty to the leather. Tooling will help prevent corners from rolling. Tooling is just a little more effort to clean than a plain saddle. You can choose from several tooling patterns with each category of saddle. The more elaborate the tooling design, the more value, the more time involved in production, and the more your investment will grow over time. Have you ever had the experience of getting a new saddle to find the stirrups won't take up enough to fit, or let out enough to fit? No more...We like to get your real inseam, (and other measurements, like we were making your chaps), then assure the saddle will fit when it arrives. Hey, by the time we get through spoiling you, you'll always want to buy your saddles and tack from us! We strive to keep some of the basics in stock. They can be to you in a week or less. But, there is nothing like having a saddle semi-custom made for your horse and your body. Allow about 2 to 4 weeks for a tree to be made, if necessary. Then the saddler needs about 4 to 8 weeks to make your saddle. Leather is cut, wet, steamed, dried, fitted and pulled. It cannot be rolled off a bolt and processed like fabrics. This does take time to do right. Allow another 3 days to a week for UPS delivery. Overseas orders will usually go through UPS, or Airborne express, (depending on your best rate or most security). Any more time is because the saddler is catching up on previous saddles, or waiting on parts, or needs to take one night off for his wedding anniversary. Saddle makers are as excited about making your saddles as you are about riding! They would rather get it right, than rush it. We have chosen our saddle making partners because of their consistency in quality of product. Cultured Cowboy knows that most of our customers will be riding for many years to come. A short wait for a really good saddle is worth your "wait" in gold! With the experience of thousands of saddles made for thousands of horse people, Cultured Cowboy looks forward to helping you with your needs. Tired legs, hurting knees, lower back pains, need grip, need freedom, need speed, need to impress your friends, need to impress your equine, need help, need a hug? Give us a call. There are too many options to Advertise every Low Price Combination we offer on every possible option! But you will find a good fair price next to each saddle. THESE ARE FIRST QUALITY SADDLES WITH FULL WARRANTEES. Because so many Reinsman Saddles are customized for your needs with choices of seats, leather color, special length stirrup leather, etc., we do not use buy buttons on this part of the website. We need to know about your riding styles to be best able to help you make a correct selection.